He tipped me off to this and I only now "found" his tip because, well, let's just say it was a clerical oversight. At any rate, according to Comics Continuum, Henry Rollins is on deck for the voice of Robotman when the Doom patrol appears on Batman: the Brave and the Bold. Henry Rollins is providing the voice of Robotman in the next season of Batman: The Brave and the Bold, The Continuum has learned. Robotman will appear along with the Doom Patrol in the Cartoon Network series. Rollins has worked with Warner Bros. Animation before, providing the voice of Johnny Rancid in Teen Titans and Mad Stan in Batman Beyond. In addition to his musical career, Rollins has numerous acting credits. He most recently has appeared in FX's Sons of Anarchy. Look for more on Batman: The Brave and the Bold soon here in The Continuum. As for the rest of the cast, looks like we'll have to wait and see. More as I know it. . . Here's some negativity for you. Just a little slice. Val needed to make another appearance here. . . I'm sure there will be a little more than this in the solicits later today. 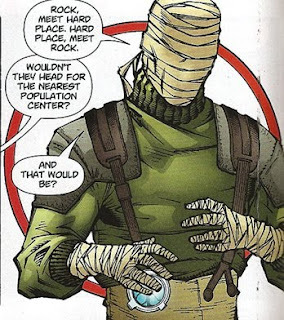 Larry Trainor from Doom Patrol #3, being, well, negative. Embrace your inner Trainor today and be negative. Just for a moment. Here's my favorite image of the lovely Rita Farr from Doom Patrol #3. Yes, this is the last page. No it doesn't spoil the story. Yes, someone is in deep trouble once Rita gets her hands on him. Even though Rita is more than a little roughed up, Clark manages to make her distinctly Rita, with more than a little hint of Diana Rigg. Hopefully Rita's got some brighter days ahead. Especially after Blackest Night. . .
A little curveball and we're back! Just a day late, but back nonetheless. Doom Patrol #3, for me, was the moment things start really clicking. Cliff is getting more than a little fed up with Larry, Mento makes the scene and establishes himself as the ultimate supercreep, and the team takes down a menace in a new and unusual way. Giffen drops a vast amount of technobabble on us, but with a re-read, that techie talk will seem just as fresh as the first. Seeing as these pages were previewed over at the source, here's just a snippet of Steve Dayton's creepiness. Later on in the issue, we learn a little more - a little TOO much about Dayton's vicarious living. Uber-creepy as I told Matthew Clark. This issue really seemed to bring it all to the table for me. 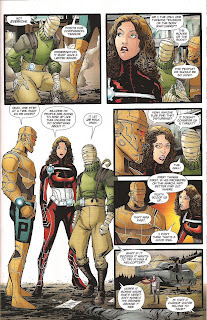 Doom Patrol is not occurring in a vacuum, and the characters interact with purpose. On occasion, that purpose may be perverted and disturbing, but the Doom Patrol has never been a happy sunny comic to share with kindergartners. 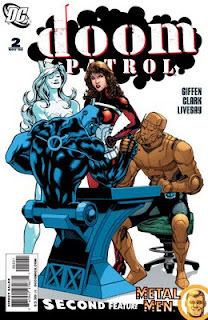 To this point, Giffen has done a solid job of establishing this iteration as a more complex take on the heroes, with a large amount of graytones in morality. I am a little put off by the ending and the team's decisions in returning to base, but I figure Giffen has his reasons. Matthew Clark's art is solid and steady here. A large amount of the characters in this issue are faceless - or rather star-faced, which I am certain presented some challenges uncommon to a traditional comic. Clark's work in this issue is spiced with some additional design elements, such as a recurring target-like circular frame. Carried through the issue, this element is simple, but effective. Clark is doing a great job of making this HIS book. Concerns I have about this series to this point are pretty specific: the story has a lot of depth. With that depth, Giffen jams a massive amount of information onto each page. I like the journal peeks, the character notes and the email snippets, but I'd like to see them treated a little more substantially in terms of graphic design. For now, they seem like ancillary pieces of the story, but when read add a considerable amount of depth to this tale. My second concern is the pacing. Right now, it seems as though Giffen is throwing things into the book to accommodate a checklist of sorts. While this expands the universe around Caulder's strikeforce, it also feels hurried in spots. The second to last page is a perfect example of this. I don't see Cliff stepping aside for this, but there it is. This issue wraps up the first arc, and clears the decks for Blackest Night. It almost feels as though this issue wrapped itself up quickly solely to make room for Blackest Night. 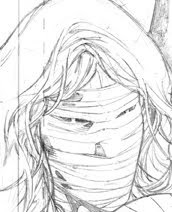 With that, Matthew Clark will take a hiatus from the art chores for two issues, set to return with issue #6. 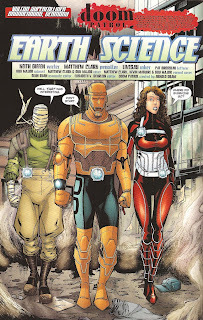 Hard to imagine that the next time we see Matthew Clark Doom Patrol art, the title will be hitting the half-year mark. Fan Expo Toronto 2009 Sketches! Long promised, but just now actually being delivered. Each year, my lovely wife allows me to get my geek on and disappear for a weekend to hit a comic convention. The past couple years, I've gone to Baltimore, before that Chicago. This year, I decided to hit Toronto. Armed with some good ol' US cash ready to be changed to Canadian bucks, I hit the border, set to flex the power of the new enhanced Michigan Driver's License. The enhanced license allows Michigan residents to cross into Canada without a passport. Kinda handy to have, since the passports take a while to get and all. Also, the Michigan Enhanced license is only $15 more than a normal license, which is roughly half the cost of a passport. The Chief, lovingly -and most unexpectedly - drawn by Karl Kerschl, of Wednesday Comics Flash and the Abominable Charles Christopher fame. In the past, I've collected (is it truly collecting if you only get one or two here and there?) sketches with a common theme or character. 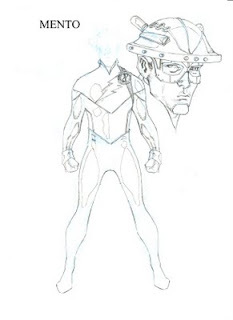 In Chicago back in 2006, I compiled a sketchbook with the members of the Justice League- Detroit era. I've got more than a few Animal Man drawings. 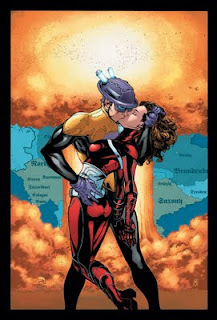 I scored a high-watermark (with watercolors) Barry Kitson Firestorm from Mid-Ohio in 2007. On this trip, however, I decided to bring a new sketchbook and collect up some DP sketches. I found Karl, with a very short list - he was the first person I pushed the sketchbook towards on Saturday - and he graciously pulled this together. I gave him free reign, any Doom Patroller he wanted to draw. 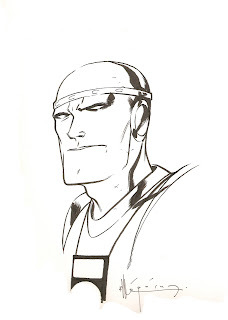 Needless to say, I wasn't expecting Niles Caulder to be the first member of the Doom Patrol to hit the sketchbook. After picking up my book from Karl, I decided to hit his Transmission X teammate, Ramón Pérez. Ramón has done a number of things, all over the board, from Star Wars: the Clone Wars stuff to some issues of JSA Classified to his own webcomics Butternut Squash and Kukuburi. I cannot recommend Kukuburi enough, as it is easily the most beautifully drawn webcomic I've come across (sorry, Karl, yours is flat-out great, but Ramón's is eye-popping). Sure, a pair of sketches may not be earth-shattering, but to start off a sketchbook with pieces this fun is more than I hoped for as I drove over to Toronto for the weekend. Exclusive Interview with Matthew Clark! That's right peoples! Matthew Clark has been even more generous with his time than ever before! A while back, I sent Matthew a set of questions and he's been kind enough to send me some answers. There is more where this came from, but for now, read on and enjoy! My Greatest Adventure: First of all, how is your health nowadays [for those of you not in the know, Matthew suffered a heart attack over three years ago]? Have you had any setbacks from your heart attack? Matthew Clark: I have good days and bad day, more good ones for stretches. No major setbacks [but] I had a bad reaction to some new medications that messed me up several months back. Something that happens from time to time, which is not fun but it's what happens when you add new medications into the system, sometimes they don't work well together. MGA: When and how did you find out you would be working on the Doom Patrol? MC: I actively sought out the project years ago I asked to draw the book when I was working on Teen Titans for a few issues. At that time there was the John Byrne version of the book starting up, after it was cancelled I asked again if it should ever start up again I'd like it. I was working on Reign in Hell ( but had to bow out due to aforementioned health problems) and they let me know that after my work on RIH I would be doing Doom Patrol. MGA: You've made no secret of the fact that you are a big Doom Patrol fan. What iteration brought you in - the original? Morrison? Arcudi? Which is your favorite? MC: I discovered the Doom Patrol after reading Teen Titans where Wolfman and Perez brought in Robotman. After that issue I hunted down the Showcase issues with the new team. A year later I was at a local show in Eugene [Oregon] and one of the dealers had MGA #80 for 20 bucks (this was in the Mid to late 80s). I have since bought all the original run and for the most part and most, if not all, of their appearances. 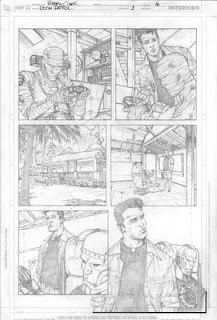 I also enjoyed Steve Lightle's brief run on the book, Those few issues made me want to really draw the book. Then several years later I got to hold a original Bruno page. I like quirky characters. MGA: They weren't clear [to me - not a gamer] in the issue [being issue #1 of the current series], but it appears as though Larry has some "tattoos" on his wrappings. Anything in particular? MC: Larry doesn't have "post-it notes" so he draws on himself and leaves notes such as gaming codes or just doodles. Each character will have little touches that if you look closely at the pages you'll find Easter eggs. Larry with the scribbles, Rita with movie posters, Cliff's t-shirts, I'm trying to give them more story. Plus it's fun to drop things in there and have people wonder. Most has a specific purpose, some is just a neat little tip of the hat. MGA: Solicits just recently popped up for issue #4, and you're not there. Will you be returning for #5? Will this be a regular rotation? MC: No I'm taking the Blackest Night issues off, the original plan was 4 [issues] on 1 off, but with Blackest Night, and the fact I wanted to draw issues #6 and #7 I opted to pass on BN. 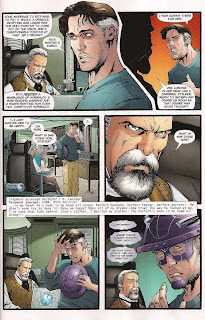 Plus, I dipped my beak in Final Crisis and that was enough for me. Crossover books like that are difficult and my hat goes off to those that do it. It's difficult and sometimes punishing to coordinate. Plus I want to concentrate on the main core group and the return of a few favorites (Keith has given hints on other board about this). That's the start of Matthew's exclusive interview with My Greatest Adventure 80. There's more to come soon. 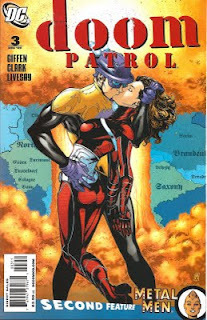 It's been such a long while since i posted anything I almost forgot that I had a Doom Patrol blog! Seriously, however, I do apologize. I've let you guys down before, and I know how that feels. I'm going to try to make it up to you, at least for a week or so. Today, well, this one's in the books. It's a Negative Monday. Enjoy. Or don't. Exclusive interview with. . . well, you'll have to check back Tuesday. Let's just say, it IS an exclusive interview. The person I interviewed is currently working on Doom Patrol. 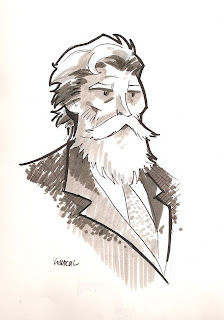 Sketches from the Fan Expo in Toronto. I promised them a while back, but I'll be posting them for your viewing pleasure. 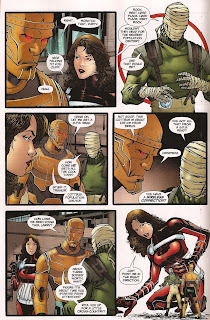 A review of Doom Patrol issue #3, due out this Wednesday. This review will not be connected to my regular reviews over at CBR. The return of Elasti-Woman Fridays, featuring the best (in my opinion) Rita Farr panel from this week's release. Sound like fun? If you said, "No." then you're taking this Negative Monday thing a little too seriously. 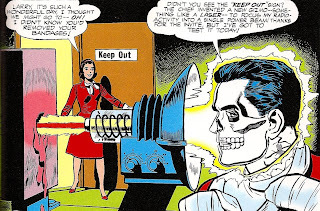 This panel is from the first page of Doom Patrol (volume 1) #104. Elasti-Girl and Mento tie the knot in this issue, with some guest stars such as Wonder Woman, Superman, and the Flash. I'm going to have to post more from that issue some day. There you go, some Negativity for you. Have a great Monday! Be sur eto stop back next Monday for some more negative energy!